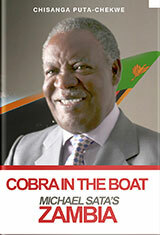 Cobra in the Boat is a riveting account of how one of Zambia's most controversial presidents got to power and how he governed while in office. Michael Chilufya Sata was a populist with huge ambitions for his country. Few of these ambitions were actually realized because of Sata's poor health and his premature death. The political chaos that followed the president's demise was a direct consequence of Sata's failure to pay attention to constitutional detail. The book shows how this crisis could have been averted. Sata's penchant for dismissing theoretical detail as a waste of time had consequences in other areas of national life. The ill-conceived pay rise for already privileged public servants, the arbitrary decision to institute an unaffordable minimum wage, and the hasty creation of a new province and several districts, were examples of decisions that could have benefitted from rigorous theoretical input before implementation. In the short time that Sata was in office, he missed many opportunities to right historic wrongs and set Zambia on a firmer path to economic prosperity. Sata's performance while in office was as complex as his own personality. As mayor of Lusaka in the early days of his political career, Sata developed a reputation for financial prudence, but as president of the republic he was profligate and often erratic. Despite this Sata did manage some successes while serving as fifth president. Chisanga Puta-Chekwe is uniquely placed to write about Zambia. Born in the copper mining town of Chingola, Chisanga was educated at Kabulonga Boys’ School in Lusaka and Sir William Borlase School in Marlow, England. He read law at the Universities of Birmingham and London before proceeding to read Philosophy, Politics and Economics at Oxford University. As a practising lawyer in Zambia Chisanga represented both corporate and human rights clients opposed to the one party dictatorship that lasted from 1972 to 1991. Chisanga ran the Chekwe Consultancy in Canada from 1989 to 1994 advising clients (including governments) on international development and public policy. He served as Chair and CEO of the Ontario Criminal Injuries Compensation Board from 1994 to 1997 when he became Executive Director of Oxfam Canada. Chisanga returned to the private sector to serve as Zambia Country Manager for a Canadian mining company in 2008. A year later he was named Ontario’s Deputy Minister for Citizenship and Immigration. Chisanga retired from the Ontario government in 2015. At the time of writing he serves as Chief Executive Officer for the Antigua and Barbuda Citizenship by Investment Unit, in addition to serving as volunteer president for the Masomo Education Foundation an organization that provides scholarships for post-secondary education. Chisanga is the author of the books, An Election to Remember (1996) and Getting Zambia to Work (2011).